Scania has released a record-breaking year-end report for January-December 2017, though its coach and bus division has struggled. Order bookings for coaches and buses in 2017 rose 8,784 units, from 7,884 the previous year. During the fourth quarter, order bookings rose to 2,299, compared to 1,535 in the fourth quarter of 2016. In Europe, order bookings fell from 669 to 492 during the fourth quarter. Order bookings fell mainly in Great Britain, Norway and Sweden, which was offset somewhat by an upturn in Lithuania. In Latin America, order bookings rose sharply to 554 units (from 276) compared to the fourth quarter of 2016. In Asia, order bookings rose by 86% to 671 coaches and buses, mainly related to Hong Kong, India and Iran, which was offset somewhat by a decrease in Indonesia. 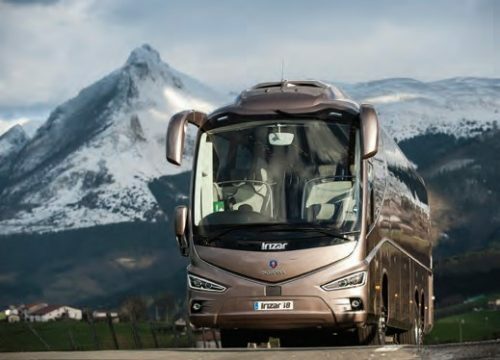 Order bookings in Eurasia rose sharply compared to the year-earlier period and totalled 381 coaches and buses, where there had been just two the previous year. Order bookings in Africa and Oceania fell by 12% to 201. Scania’s coach and bus deliveries totalled 2,509, a small decrease from 2,581 the previous year. In Europe, fourth quarter deliveries fell to 461 (from 587). In Latin America, deliveries fell to 587 (from 751). In Asia, deliveries fell by 2% to 927, while deliveries of coaches and buses in Africa and Oceania fell during the fourth quarter to 230 units from 265. Deliveries to Eurasia rose sharply to 304 units, up from 29. Net sales of coaches and buses fell by 4% during the full year 2017 to SEK 10,480m (£900m). During the fourth quarter, sales fell by 16% to SEK 2,796m (£240m). Henrik Henriksson, President and CEO of Scania, commented: “Scania’s net sales rose to a record high SEK 119.7 billion (£10.2bn), an increase of 15% compared to the previous year. Truck deliveries reached an all-time-high and demand for our new truck range was good. “Higher vehicle and service volume impacted earnings positively, offsetting higher production costs for running double product ranges, constraints in the supply chain and an unfavourable market mix. Operating income in 2017 amounted to SEK 12.4 billion (£1.06bn) which gave an operating margin of 10.4%.